You can access the Add New Page screen by choosing Add New from the Pages widget in the sidebar. This screen functions exactly like the Edit Page screen with the exception that the "Update Page" button is now the "Publish" button because the page has never been published. Once the page is published this button will become the "Update Page" button. 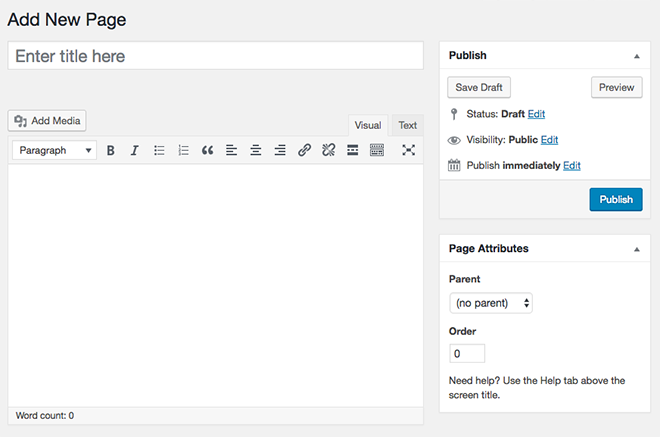 There is no content on a new page so you are free to be creative and design your own page from scratch. Hint: It's a good idea to plan your page on paper or in an application you are familiar with, like Microsoft Word for example, before entering the content into the admin system.